Joey Weller, vice president of sales for Grady-White Boats, left, and Kris Carroll, president of Grady-White Boats, right, present the coveted Gold Anchor Award for Outstanding Customer Satisfaction to Diane Fricke, Travis Fricke and Justin Fricke with Fish Tale Sales & Service of Fort Myers Beach. FORT MYERS BEACH, Fla. (Sept. 19, 2016) — Grady-White Boats announced Fish Tale Sales & Service is the top-ranked dealer in the world for customer satisfaction. The boat builder awarded Fish Tale the coveted Gold Anchor Award for Outstanding Customer Satisfaction. The award signifies that Fort Myers Beach-based Fish Tale is the top-ranking dealer in customer-satisfaction index scores among all the Grady-White Boats dealers worldwide. “Fish Tale Sales & Service is dedicated to participating alongside Grady-White in an effort to offer the most enjoyable boat-buying experience possible for every person walking through the door,” said Joey Weller, Grady-White’s vice president of sales. “They’ve created an environment in which buyers know their values will be taken in to consideration and their ultimate expectations are going to be exceeded consistently with an attitude that demonstrates the passion and knowledge required to be the worldwide best,” Weller added. In addition, Fish Tale earned the Admiral’s Circle Award. 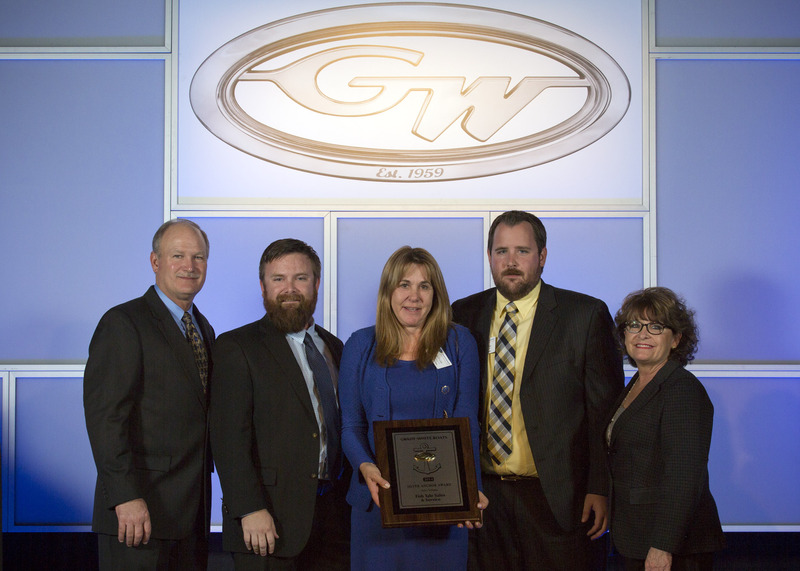 The prestigious award is limited to the top Grady-White dealerships that have posted more than $2 million in sales for the model year and earned the boat manufacturer’s award for customer-service excellence. Dealers must score at least 9.5 out of 10 in customer surveys to earn the Customer Service Excellence Award. Owned by the Fricke family for 20 years, Fish Tale Sales & Service is one of the most modern full-service marinas in Florida. In addition to sales, the marina has room for 250 boats in dry storage and 95 boats in water slips. The marina is located at 7225 Estero Boulevard in Fort Myers Beach. For more information visit www.fishtale.com. Established in 1959 and based in Greenville, N.C., Grady-White Boats manufactures a variety of versatile, high quality center console, dual console, express and walkaround cuddy cabin sportfishing and coastal family boats from 18 to 37 feet. Grady-White boats are built by craftsmanship and designed through customer input and a longstanding, sincere focus on attention to detail. For more information visit www.gradywhite.com.